When creating a Rosh Hashanah menu, I’m always thinking about balance. We eat so many sweet foods to celebrate the Jewish New Year, which is a wonderful tradition– but it can also be overwhelming. Honey, apples, tzimmes, cake, kugel… it’s a lot of sweetness. That’s why I love serving saffron rice as a Rosh Hoshanah side dish. The subtle, savory saffron flavor compliments all the sweet, rich flavors of the Rosh Hashanah holiday. It tastes buttery, even though it’s dairy free. It’s super easy to make for a large crowd, and takes less than 45 minutes from start to finish. It’s also very pretty and festive. 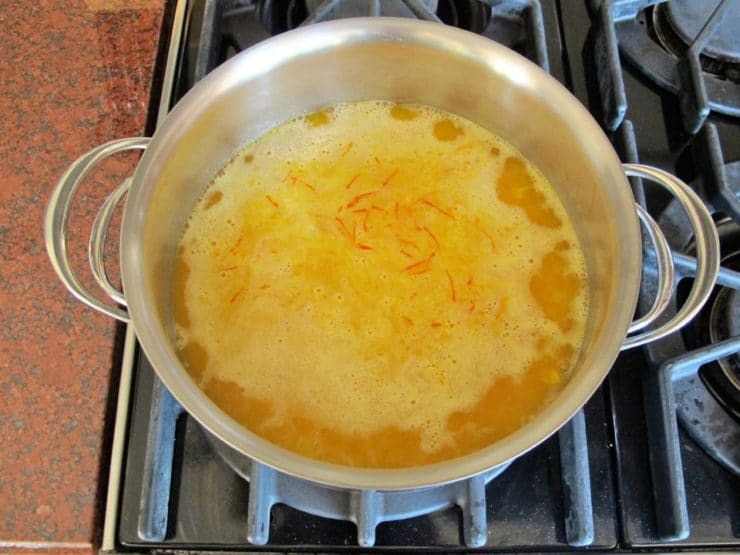 When my friend Farah taught me some of her family’s Persian Jewish recipes last year, she gave me a tip that helps to open up the flavor of the saffron spice. She suggested soaking the spice in hot water for a few minutes before adding it to the dish. 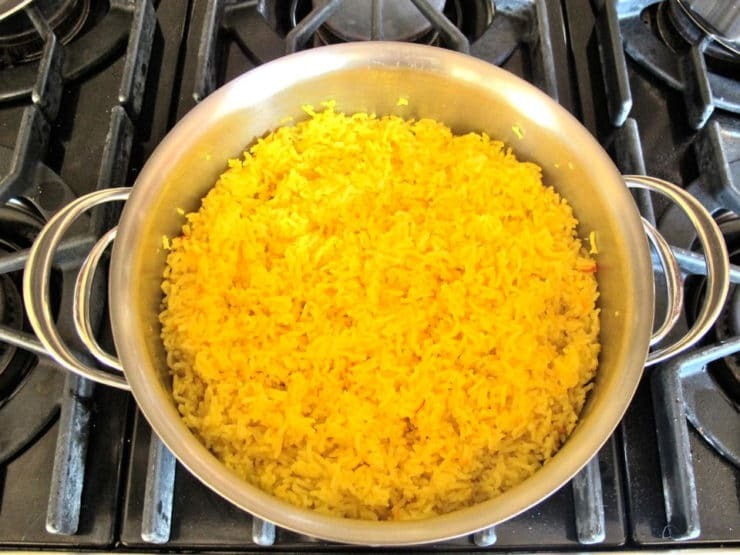 I now do this when I make saffron rice, and it makes a big difference on flavor. 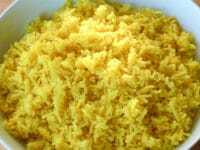 The rice becomes rich with saffron flavor and aroma. #1: Invest in good quality saffron. I say invest, because saffron can be very pricey. You only use a small amount, but you also get a very small amount in most bottles. If a bottle of saffron threads costs less than $10, it’s probably not worth buying. I don’t recommend the bag full of saffron that costs $5… it’s not the stuff you want, and it won’t give you the flavor you need. 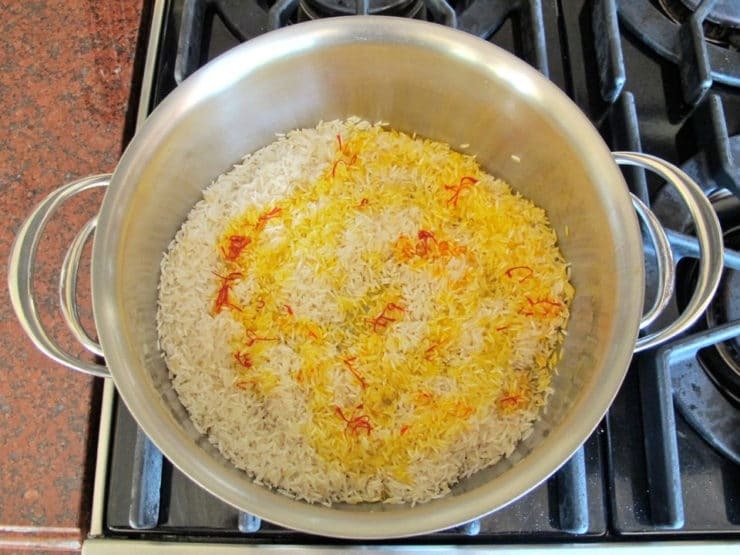 #2: Don’t omit the salt… the combination of salt, saffron, and caramelized onions gives this rice a rice, buttery flavor. You won’t believe there’s no dairy when you taste it! 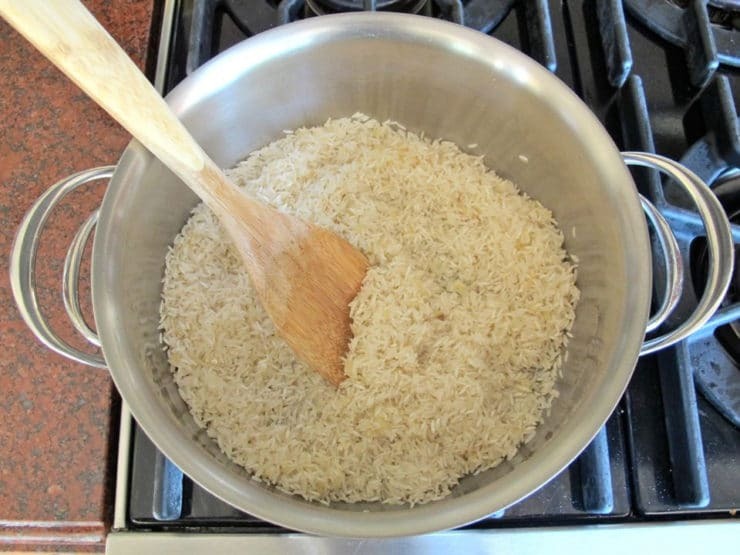 #3: Buy white basmati rice; don’t substitute long grain rice or brown rice. The flavor and texture won’t be the same. If you’d like to make this dish pareve or vegan, you can use water in the place of chicken stock. I prefer the chicken stock because it adds a lot of flavor to the rice. If you do use water, add an extra pinch of salt to make up for the salt in the chicken stock. We eat saffron rice all year round, particularly during the winter months, because it’s both healthy and cozy– it’s the kind of comfort food that is good for you. It’s also gluten free if you use a certified GF chicken stock. Enjoy!! Take one pinch of saffron threads and put them in a spice mortar. 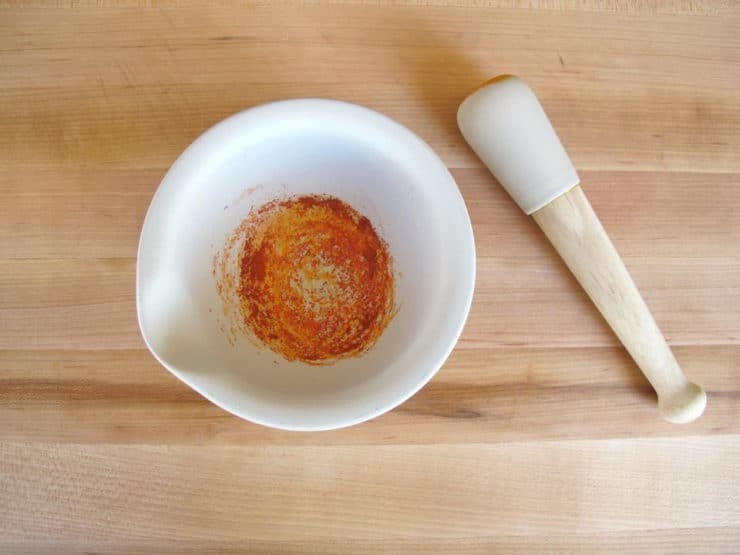 Grind the spice with a pestle to a powdery consistency. Add a second pinch of saffron threads to the mortar. Do not crush these threads. Pour 1/4 cup of hot water into the mortar. Let the saffron soak for 5 minutes. This will open up the flavor of the spice. Meanwhile, sort your basmati rice and rinse in a colander. Drain. In a large heavy pot, heat extra virgin olive oil over medium. Add the minced onion to the pot and saute for about 10 minutes, till the onion begins to caramelize. Add rice to the pot and saute for one minute longer, mixing the rice together with the cooked onion. Pour the yellow saffron liquid evenly across the top of the rice, making sure to scrape any saffron that clings to the mortar into the pot. Cover the pot and reduce heat to low. Let the rice cook for 20 minutes, or until all the stock is absorbed and the rice is tender. This is a great simple recipe. I do not eat rice so I substituted crumbled cauliflower for the rice and my husband loved it as well as did I !! A real keeper. Looks yummy, but do you know how to make it so that it leaves the brown crust in the pan that everyone fights over? What happens if you use brown basmati? I do not recommend brown basmati for this recipe, the texture and flavor will be quite different and it will take longer to cook (and more liquid). I made it with jasmine rice, it was all that I had on hand, and it turned out wonderful! I used the same amount of rice and chicken broth. I did let it cook a little longer by about 10 minutes, fluffed, and then let it rest for about 10 minutes more. It came out beautifully! I will tweak in the further to be less rice, I personally don’t need 2 cups of uncooked rice, for a crowd I would. Will definitely make again! This recipe was so simple and delicious! Absolutely love it and made it exactly as written. 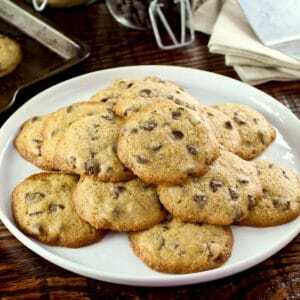 Perfect as is or you can add some dried sweetened cranberries for added color contrast and a delightful flavor meld. Hi Tori. This is an indeed very beautiful recipe. 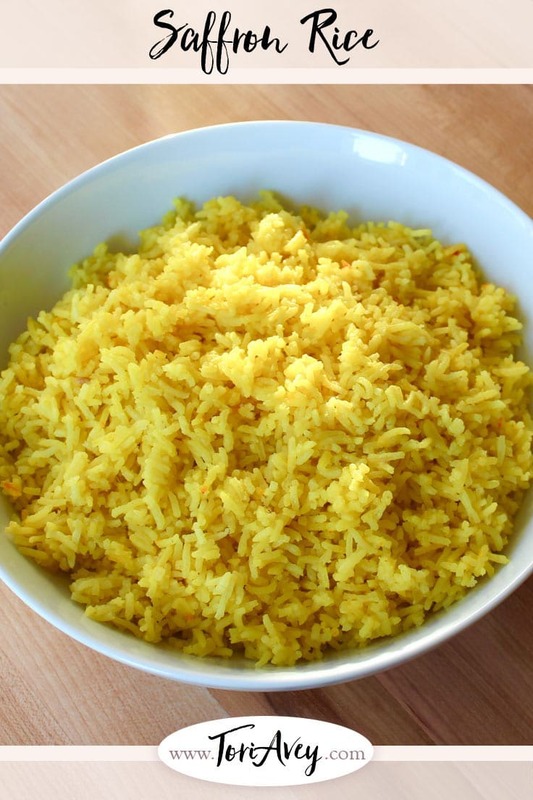 What would you serve the saffron rice with, traditionally? I would love to try. Also, can I use red onions instead of yellow ones? I made his last night and it turned out just great! I used chicken stock instead of water and yellow, not sweet, onion. I’ve had saffron in the cupboard and wanted to get it used before it went stale. I buy my saffron and other spices from the India Bazaar grocery stores and have been learning to use every spice in the store. Easy recipe, took maybe 20 minutes to prepare and was delicious. I really thought saffron rice would be more involved. Thank you! Thank you so much for this great recipe! I followed it exactly as written with one minor change to suit my picky kids. I carmelized the onions and then threw them in my Vitamix with a little broth so there were no onion pieces. This was delicious, my kids loved it! 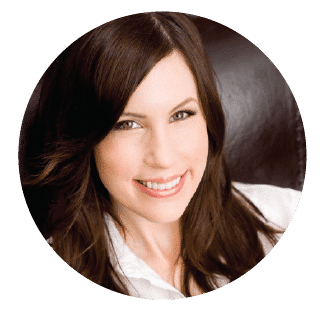 I’ve been looking for a healthier alternative to the packaged rices that have so many chemicals in the ingredients. I don’t need to look any further, I will make this again and again. Thank you!! This is truly amazing!! I have made this about 6 times now. 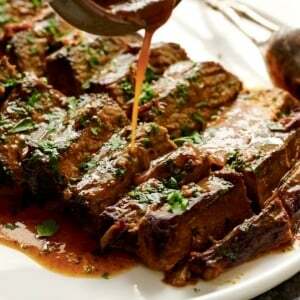 Each and every time it is wonderful and flavorful. Use basmati rice. Use good saffron. Pre soak saffron and pre cook rice as instructed. Turned out the best flavor type rice I have ever produced. Thank you for sharing. Absolutely amazing!!! I make this recipe ALL the time. It’s a family favorite!! Ok, I did use too much broth – a full 4 cups instead of 3 & 3/4 c. Didn’t realize it until after it was all done! But everything else I followed to the letter, and used 2 nice-sized pinches of saffron. But my rice isn’t yellow! 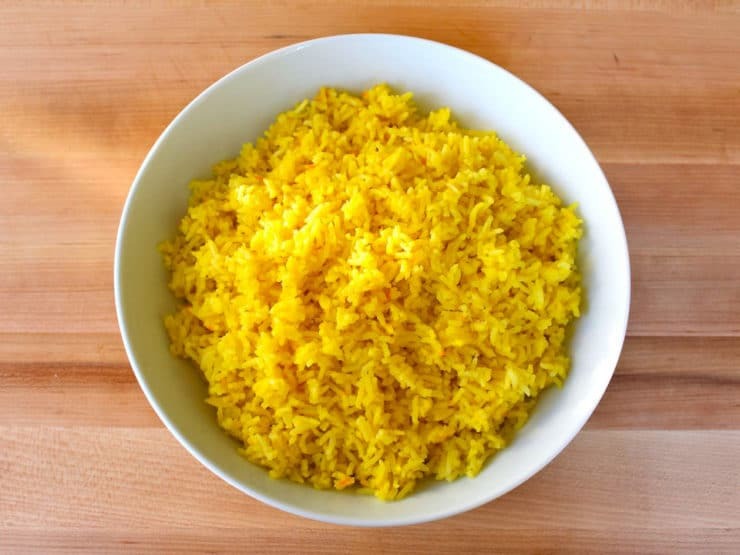 I’ve made saffron rice before but not this recipe, and it always has a much nicer color than this! Could it be that my saffron is a few years old? I don’t know, but I was disappointed. It tasted okay, but didn’t look right. On a side note, I’ve made some of your other recipes and everything has been fantastic! I will try it again soon with 1/4 c. less broth and some new saffron. Hi Sue– first of all, glad you are enjoying the recipes. 🙂 Are you sure the saffron you used is real? Read the details above regarding real saffron vs. fake, the fake kind which is cheaper has no flavor. If your saffron is definitely real, it should have plenty of flavor… have you used this saffron in other recipes with good results? I love the look, smell and taste of this recipe. I make it exactly as Tori posted it and it turns out beautiful and delicious every time. I have now shared the recipe with my sister’s family and my adult son, who makes it once a week. Thanks so much for the great recipe. Yes, Jasmine is wonderfully flavored rice, but it’s bouquet and flavor contrast unfavorably in the presence of Saffron. Palette overload. Fwiw, my vegan Saffron Rice recipe is made with one clove of minced garlic, water in place of chicken stock, and vegan butter in place of oil. As Tori states, real saffron basmati rice, and salt are essential. Fyi- When purchasing saffron the buyer MUST beware. Caveat emptor applies here, as it’s far more likely that most will purchase a bastardized “version” of the spice. Due it’s expense, it’s often adulterated in numerous ways as to deceive the unwary customer. Never purchase saffron in a powdered form as it WILL be fake, containing little measurable saffron. Rather, always buy Saffron in it’s native picked form… Threads. But you must still be wary, as dyed colored pistols from other plants are often substituted and added to saffron to deceive the casual buyer. Although I won’t fly a flag for a company, I will say that a brief search for an ISO certified vendor out west would find you in good supply of the best certified middle-eastern saffron I’ve yet encountered. I was wondering if I could substitute chicken stock for chicken broth? I soaked the saffron in coconut milk and the result was spectacular. Thanks for the recipe, it’s become a family favorite! Thank you for this important tip! 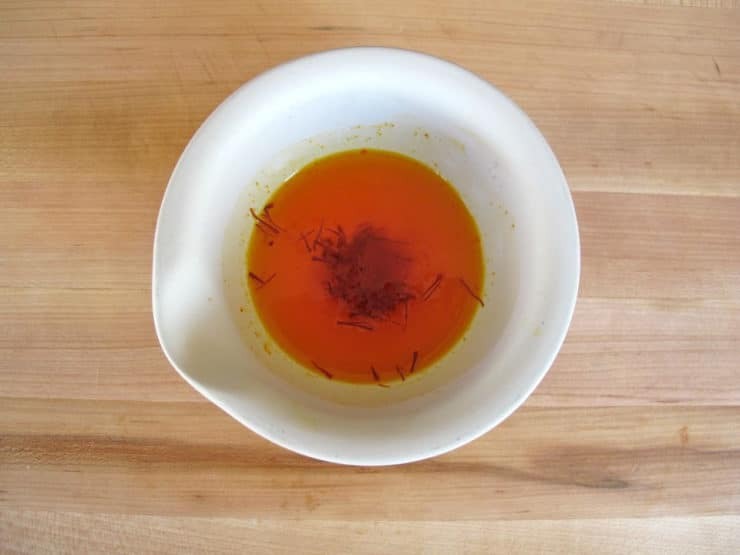 I used to heat the saffron in hot broth using a microwave, but today, I took your cue and put half table spoon of olive oil in the small bowl containing the saffron (which I crushed using the hand-end of a smooth babyfork) with some broth and microwaved it. I got a wonderful mixture to work with. Thank you! i might modify the recipe to be more specific about that “large” pot. i used my large pot, which looked to be the same size as the one in your pics (but impossible to tell, since there’s no reference for scale). 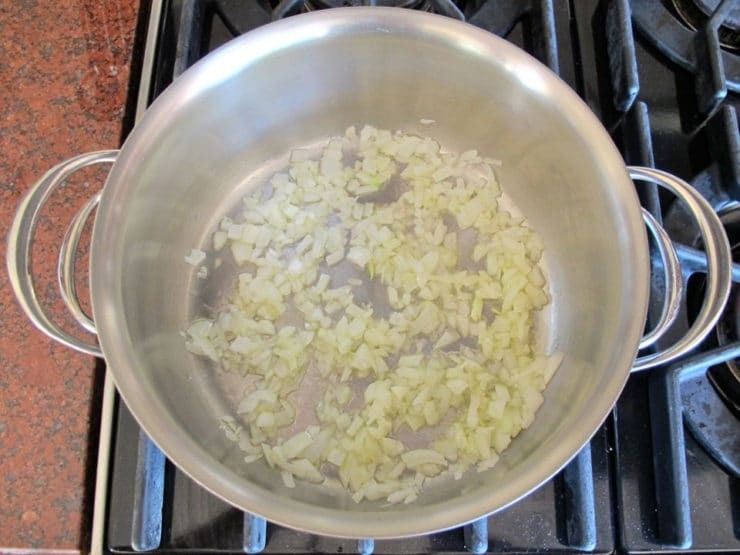 A small onion with 1 tbs oil in a large pot, even on low, will take way too much heat over 10 minutes. My onions burned, and i had to start over again. Second time, i added more oil and more onion to suit the pot size a bit better. And another picky point, but perhaps an important one: maybe you could specify which kind of “cup” you mean when you measure the rice – a standard 250 ml measuring cup, or rice cup (the Asian “cup” measurement that you work with when you make rice, particularly in a rice cooker). From what I am seeing on this recipe (comparing to others I have used), I surmise it is referring to the regular 250-mL cup. I’ve made this recipe before on the stove top and it came out great. My problem was a bit of a burn at the bottom of the pan, but that’s my fault. I just purchased a tiger rice cooker and was wondering if I can keep proportions the same. I will be making it again this weekend, but in the rice cooker. I don’t have a rice cooker so I can’t advise you on the specifics, but it should come with instructions for modifying existing recipes. The only thing that might change would be the amount of liquid, but I can’t say for certain. Good luck! I have cooked saffron rice in a rice cooker. My experience is that they turn out the best if I let the rice (raw, but I used hot broth) and the ingredients (cooked or warm) COVERED in a pre-warmed rice cooker (no heat on) for 30 minutes. Do not remove the cover. Cook the rice as you normally would. Doing it this way preserves the saffron aroma better than if I uncovered the ‘inner’ pot (I use a Tatung Rice Cooker – the method of cooking is steaming over water). I am been looking for this recipe for what seems like forever. So happy to have found it! Where can I buy Saffron Threads? I have never seen it but I would enjoy adding this herb to my culinary skills! Thank you so much!!! Hi Penny, saffron can be found at most major supermarkets, Middle Eastern markets and gourmet shops. Can I make this recipe ahead for time and the next reheat it for dinner ? No more store bought saffron rice “add butter and water” for me! This recipe is!! I made the rice tonight for the first time as a side to chicken breasts and followed the directions to the letter and it turned out fantastic. My wife says I can make this anytime I want. Yum the flavor is good, but cooked the rice 2x as long and it was still a bit crunchy. We added some berebere spiced carrots, cauliflower and chickpeas on top. This sounds fantastic. I am going to have to look up a recipe for the Berebere veggies and chickpeas. to go with this rice recipe. This rice was wonderful! It came out better than any other rice I have ever made and I am 65 years old! Very happy to hear that Candee! Has anyone tried this with quinoa instead of rice? Wondering how it tasted, or if any “tweaks” needed to be made to the recipe. Thanks for the “pinch” amount clarification! I am making Chicken Continental (Naomi Judd’s recipe) and couldn’t find her recommended “packaged Mahamta saffron rice”. So making my own with unflavored Mahamta basmati! 1.I want to know what do you mean by 2 pinches of saffron threads could you be more specific? 2.On the second pinch you say do not crush these threads. I’m confused because it says to crush the first threads. Could you explain. This recipe looks delicious, and I just want to make sure it comes out perfectly. Hi Jacqueline, Tori’s assistant Ashley here. For cooking, saffron is most commonly measured in “pinches” because the threads are too difficult to neatly measure into teaspoon amounts. A “pinch” of saffron is several threads. Half of the saffron threads are crushed and half are left whole so that there are whole threads of saffron mixed throughout the rice. I’ve made this about a half-dozen times (including tonight)! I think next time I’ll try adding some slivered almonds. I can’t tell what the big deal is with saffron. I know it’s expensive, but for some reason I think rice is rice- I used Jasmine. Is it because I made rice with a rice cooker? Hi Mimi, Tori’s assistant Ashley here. 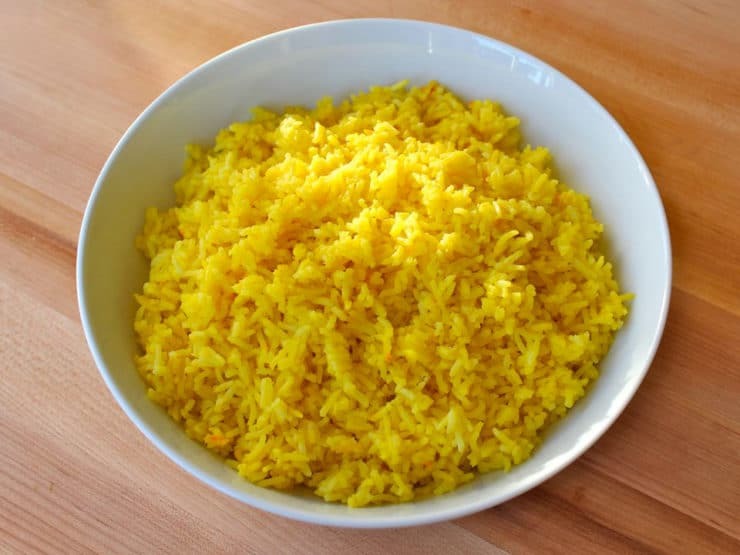 Saffron lends a nice, savory flavor to the rice that is very unique. It is certainly expensive, but in our opinion quite worth it. Plus you usually only need a small amount. I”m not sure about the rice cooker. Yummy! I used veggie no-chicken broth (Butler – Chik-Style Seasoning) and it worked perfectly. I clicked through to an ad to help support the website. Thank you! I have made this recipe and it is really good. I add some coconut oil with the salt. Yum! My first attempt and loved by all. My husband had brought a VERY small jar of saffron back from Turkey. It was delicious! Love this dish! Love to make it with koftas although it was also the perfect Easter side dish today as well. I am lucky to have some real Persian saffron and it really makes a difference. You are correct, Persian saffron makes all the difference! Made it tonight using….gasp…Uncle Ben’s & it was still delicious. Nice fluffy flavorful rice. I have just finished making this dish for my husband and it came out perfect. I added corn to this recipe.